2.4GHz handheld receiver with a built in 2.5" LCD screen, 4 channel receiver allowing multiple view points from different 2.4GHz wireless cameras (four in total). The Palmboy unit has a built in speaker for audio monitoring and also comes with two re-chargeable li-batteries (each battery will allow approx. 2hrs usage), the camera is equipped with channel selection switch as well as a built in microphone. The Receiver also has a video out socket, allowing video and audio can be recorded using a standard VCR, camcorder etc. 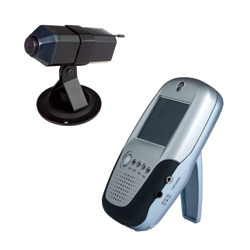 This camera kit makes an ideal surveillance device for many other situations as well as a baby/security monitor. Join Our Affiliate Program and Get Paid for Every Sale! Old Legacy Discussion Forum can be found here. Free Online Exposure for Your Business!